Hollywood screenwriters work diligently to ensure their fantasy/espionage/superhero plots make sense. It’s a point of pride among these moviemakers that even the silliest-seeming picture has its own “internal plot logic.” In Judex, Georges Franju proved that the only logic that is needed for a “fantastic” thriller is that of a dream. The 1963 classic, released here in a three-disc, dual-format package (two DVDs, one Blu-ray), moves surprisingly slowly for a film derived from the cliffhanging serial of Louis Feuillade (who made the original Judex in 1914, with the serial premiering in 1916). But that seems appropriate, since Franju’s pacing and visual approach owed more to Cocteau (Beauty and the Beast, Orpheus) than Feuillade. Characters in the film speak familiar thriller dialogue but they proceed in a dream-like fashion and are often shown waking up or being knocked out. The title character, Judex (Channing Pollock), is a self-appointed avenger of the innocent (“judex” means judge in Latin) who is a master of disguise as well as a sleight-of-hand magician. 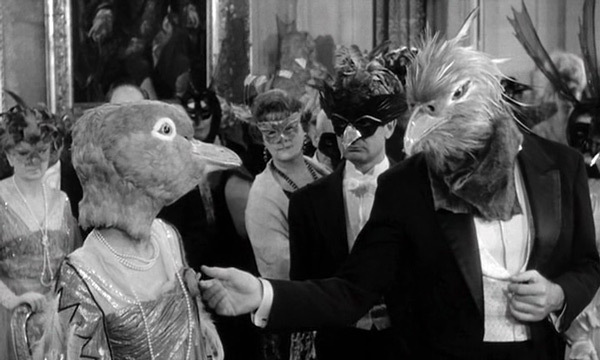 We first see him as he entertains a costume party in a tuxedo and a bird headdress. The film’s villainess (Francine Bergé) is similarly “coded” by her outfit — she wears a catsuit in the key action scenes and is clearly in the lineage of both Irma Vep (from Feuillade’s Les Vampires) and Catwoman. Our two costumed principals are surrounded by a group of quickly sketched characters: a corrupt millionaire (Michel Vitold), his good-natured daughter (Edith Scob, Summer Hours ), and a private detective (Jacques Jouanneau) who is always several paces behind the crooks. A criminal masquerade unfolds in Judex. Franju distills the surreal aspect of the cliffhanging serial while also emphasizing emotion, through the use of a beautifully sentimental score. The composer is Maurice Jarre (Lawrence of Arabia), whose delicate music stands in stark contrast to Franju’s fantastic visuals. The supplements here come from various French sources, each one shedding more light on Franju’s method and mixed feelings about the film. Co-scripter Jacques Champreux (who is a grandson of Feuillade) tells us how Franju wound making Judex instead of his dream project (a remake of Feuillade’s Fantômas). Champreux also notes that Bardot was sought for the role of the villainess, but her price was too high. In her interview, co-star Bergé recounts how Franju became interested in her, and the reason he picked her to wear the catsuit. “You have an evil air about you,” he told her. She also derides her own work in the film by noting somewhat cheerfully that she “doesn’t do a lot of acting” in Judex. The package also includes two shorts by Franju. “Le grand Méliès” (1952) is a valentine to the pioneering filmmaker that is comprised of George Méliès shorts and sequences in which actors (led by Melies’ son, playing his father) play out scenes from his life (in a film a quarter of the length of Scorsese’s Hugo). “Hotel des Invalides” (also ’52) is a chilling documentary study of a military museum. In the interview snippets, he exhibits conflicted feelings about the film. He admits that, as a character, Judex is not just a cypher — he’s in fact barely there. He does, however, proclaim that he loves the picture, being especially moved by an action-less, meditative scene in which Scob strolls down a hallway, looking into empty rooms in her father’s chateau.